In August 2014, Andrew Ross and his family moved to Evanston because the Chicago Public Schools system wasn’t working for them. Every day, Ross’ children were “crammed” into classrooms with more than 30 students, which he said negatively impacted their learning. Ross said he then believed that Evanston/Skokie School District 65 would provide “strong and vibrant places of learning.” The class sizes were smaller and students of different grades weren’t grouped together. Two and a half years later, Ross said he maintains this impression. Over the last 10 years, District 65 has grown by about 1,500 students, in part by welcoming new families like Ross’. But as a result, the district has faced $20 million in additional costs to support the increased staffing and expanded programming necessary for a larger student population. Though the district’s expenditures have long been higher than its revenue, it had been able to balance its budget by making roughly $11 million worth of reductions since 2010, District 65 board president Candance Chow said. 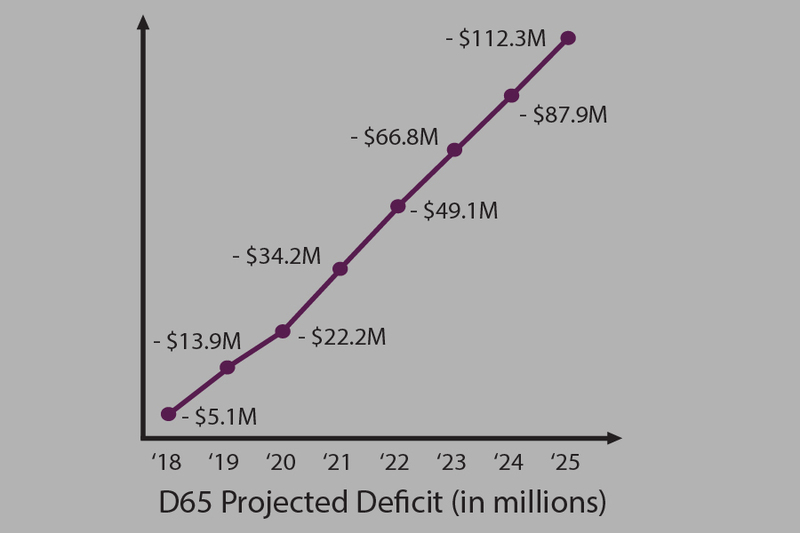 However, Chow said the district’s current reductions are no longer enough; from fiscal year 2018 until 2025, District 65 has projected an inevitable cumulative deficit of $112.3 million. Chow said any more reductions would significantly impact the classroom: Schools could close, multi-grade classes would be created and average class sizes would significantly increase — changes Ross’ family moved to Evanston to avoid. She said there were only two options left on the table: make these significant cuts — $8.8 million worth in the first two years alone — or increase revenue through a property tax referendum. In January, the school board voted unanimously to add a referendum to Tuesday’s municipal ballot that would raise property taxes by about 5.8 percent for Evanston residents. Should the referendum pass, the district would receive $14.5 million more in revenue each year, preventing additional reductions. Still, Chow said some residents have expressed concern about further funding an education system that won’t work the same for every child and that may drive lower-income families out of the area due to the increased tax. District 65 spends about $14,000 on each student, and with about 1,500 new students, the district has struggled to keep pace, superintendent Paul Goren said. 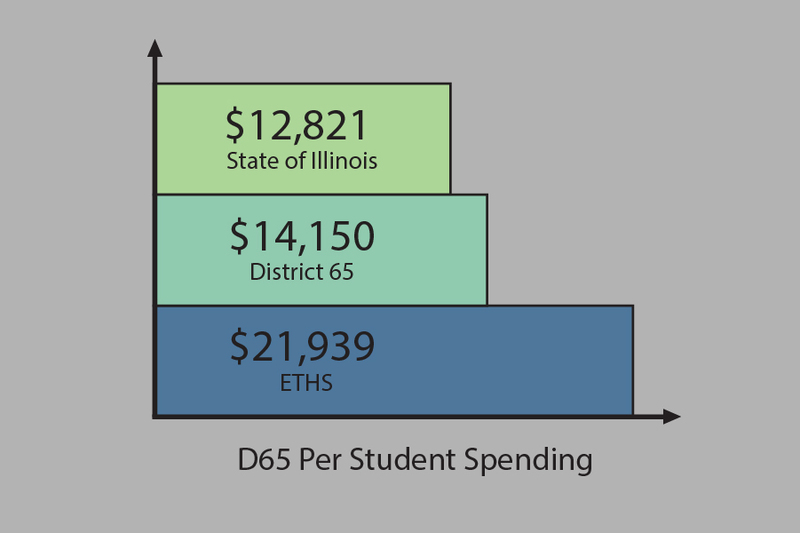 Because Evanston Township High School, which is in District 202, can spend about $22,000 per student, Goren said District 65 has to make up the roughly $7,000 differential to meet the needs of students who graduate District 65 schools and attend ETHS afterward. 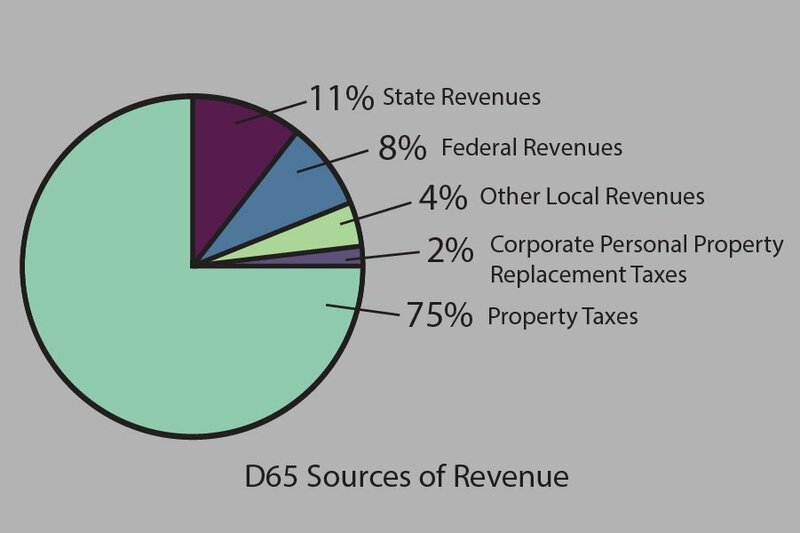 Goren said because the state allocates only $600 per student, District 65 heavily relies on local property taxes to account for 75 percent of its budget. Together, the state contribution and property taxes have only yielded 17.5 percent of the costs associated with the influx of new students. Furthermore, the increase in revenue the district receives from property taxes is limited to the Consumer Price Index, which has been historically low at 0.8 percent, Goren said. Meanwhile, District 65 costs are consistently increasing between 3.5 and 4 percent each year, he said. For the past seven years, Chow said the district cut $11 million from its budget, mostly impacting non-instructional spending like supplies, consulting contracts and custodial and central office staff. She added that 40 percent of the cuts impacted instructional spending like reading support specialists, assistant principals and schools’ curricula. In addition, Chow said the district tripled fees — like those for technology and transportation — for families in the last four years and established private funding partnerships, which bring in roughly $4 million to $5 million annually. But, Goren said, neither is enough to sustain the district through its projected deficits. The $14.5 million referendum is the first District 65 has posed to the community in 30 years, which Goren said speaks to the prudent management of the district’s finances. “(The referendum) really gives us the opportunity to not only maintain momentum, but accelerate the momentum that we’ve started on student growth, student outcomes and sort of making a difference in the lives of all Evanston students,” Goren said. Chow said the $14.5 million received each year will cover that year’s projected deficit, add $1 million to the district’s savings account and provide $1 million to infrastructure projects. The remainder of the money will be kept in a separate reserve account to balance future operating deficits. In addition to maintaining learning supports, average class sizes of 20 students and community partnerships, the money would restore a reading specialist at each elementary school and expand the 1-to-1 technology program at middle schools. The referendum also accounts for a total padding of $2 million for losses that may occur from state-level budget cuts. If the referendum does not pass, $8.8 million of reductions would be made in the first two years. Average middle school class sizes would increase to at least 28 students, assistant principals as well as teaching and administrative staff would be reduced and grant money given to schools for capacity building would also be slashed. But Chow said the impacts that hit closer to home include forgoing a new science curriculum, eliminating fourth and fifth grade band and orchestra, and doing away with middle school athletics. She said schools would also eliminate a 23-year-old camp program aimed at exposing fifth graders to the outdoors. Over time, the district could see further increases in class sizes, the closure of some schools and the implementation of multi-grade classrooms. The partial elimination of full-day kindergarten programs, an African-centered curriculum, reading specialists and climate teams at every school could also take place. But because of the district’s commitment to equity, Goren said these features — which cost $5.6 million — would remain for at least the first year. Ross, the resident who moved to Evanston seeking a better education for his children, said he and his daughters have knocked on hundreds of doors over the last few weeks to advocate for the referendum. He is part of the Committee to Save Our Schools, a grassroots effort by residents trying to drum up votes in favor of the tax hike. Though the referendum is backed by school board members, elected officials and many residents, Ross said the committee would not take any votes for granted. On election day, he said the committee aims to have 300 volunteers at the polls. 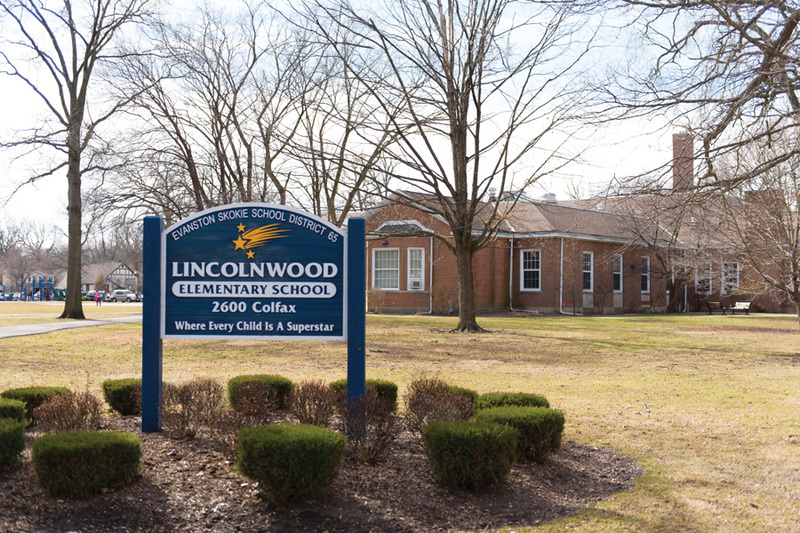 At a District 65 board meeting on March 20, however, Evanston resident and former board member Terri Shepard spoke on behalf of parents who would be voting “no” to the property tax hike. Shepard said her children went through District 65 and received a successful education, but not all parents can say the same for their children. These parents, she said, have a difficult time believing the referendum will make a difference. 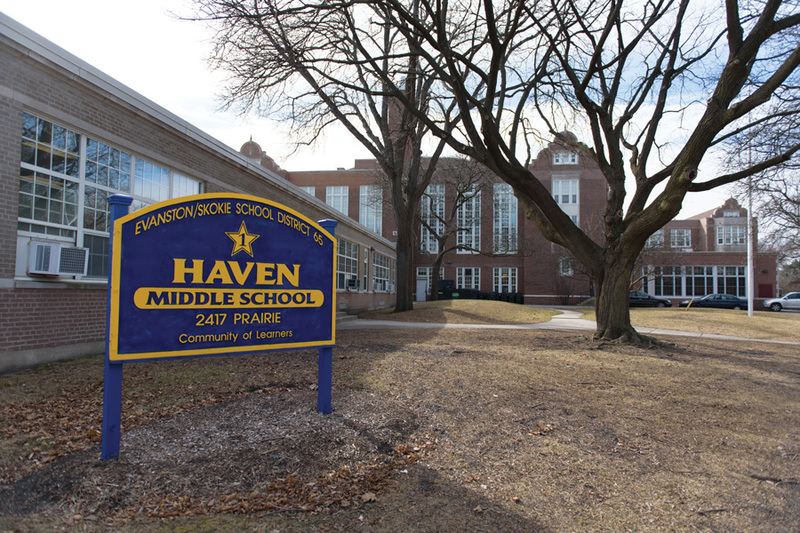 Haven Middle School, 2417 Prairie Ave. COmmunity members will decide on the future of District 65’s funding by voting on a property tax referendum Tuesday. Chow said there have been “concerns within the African-American community” in Evanston that the district has not delivered the highest educational outcome possible. In 2016, District 65 had a 48 percent composite achievement gap between black and white students, and a 41 percent gap between Hispanic and white students, according to the Illinois Report Card. Other residents are concerned the tax hike will drive more people out of Evanston, which ties into the larger issue of affordable housing and would affect economic and racial diversity, Chow said. Chow, Goren and other officials have been discussing how to mitigate the impact should the referendum pass, through offering tax relief for lower-income families, Chow said. They hope to create a solution that will eliminate the financial issue.